Number 2 2017 Numerology Horoscope forecasts that this year basically is indicative of persistence. The number 2 asks you to follow your goals with patience in spite of the many problems you are likely to face on the way. Do not expect instant success in whatever you do in the year 2017. Follow your objectives with diligence and endurance and you are sure to succeed. Each number symbolism in numerology has a distinct significance and the meaning will impact your life in a particular fashion. When your personal number happens to be number 2, you can definitely expect some encouraging transformations in your life in the year 2017. Personal year number 2 has some inherent qualities associated with it and the way it is going to affect your life is explained fully in this article. 2017 numerology predictions for number 2 predict that if you want to succeed, you have to assess your capabilities and use them to your advantage. Do not make the mistake of running after things which are not to your liking or which are against your basic traits. Personal year number two is asking you to do only those things in 2017 where you can excel and it is imperative that you have a firsthand knowledge of your full potential. Get your free numerology readings. 2017 Numerology number 2 forecasts suggest that this personal year stands for collaboration. If you have to succeed in the year 2017, you have to rely on the cooperation of others. Your success depends on how well you can get along with others. It is essential that you enlist the support of your friends and family members. You can cross all hurdles easily with the help of others instead of trying to tackle things on your own. The Personal Year 2 2017 is favorable for new friendships and love as per the forecast for number 2. With the emphasis on friendship and teamwork during the year, it will be easier to find suitable personnel and get things done. You should be prepared to accept new love and social relationships as they come up without being judgmental. Your priority in the year 2017 should be to make new friendships and avoid making new adversaries in life as far as possible. New friends will be helpful in creating a life of harmony and you will start enjoying your life without tension. Similarly your fresh love alliances will enhance the happiness in your life. Get your free numerology compatibility reading. The 2017 numerology number 2 horoscope warns you to be careful that you will not create any disturbances in your new romantic friendships and strive to have an enduring partnership. Numerology 2017 prediction for number 2 suggests that disagreements with your love partner will create tension in your life during days to come. On the flip side, in the midst of fresh friendships and romances, you should be ready to face obstacles and turmoil in the year 2017 as per the 2017 numerology predictions for the personal year number 2. Compared to other personal year numbers in 2017, you will have a relatively hectic life coupled with plenty of worries though they may not destroy your life. In spite of these problems life will be excellent in the year 2017. 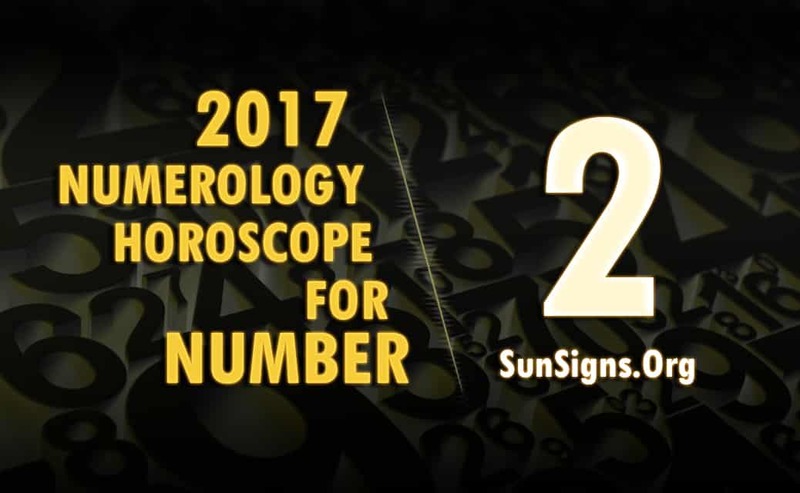 The numerology horoscope 2017 for number two advises you face life calmly and with a cool frame of mind. Any rashness on your part will make it a difficult year for you. It is imperative that you should be careful not to create any disharmony in your new alliances and tackle problems as they come without tension. If you take these small precautions, you will have a wonderful 2017 with your personal year number as 2.